N.B. Clicking on any one picture/photo, opens all the pictures. Canlitbooks.ca is an ongoing labour-of-love blog project dedicated to displaying and sharing key images and information about pre-21st-century-English-Canadian literature (though some key French-Canadian authors are highlighted), books, and authors. Originally, in the first decade of the new millennium when I began this project, it was intended for book publication, but it then ‘got too big’ and more significant; my collection includes audio-visual items, autographed items (you’ll see many authors’ signatures, photos and rare ephemera, as well as dust-jacketed books), ironically at a time when an audience and demand for such a specialty Canadian project had become smaller, and as the teaching of Canadian literature in schools had begun to decline or simply disappear after a three-decade, high-profile run. There is, then, simply put, a total dearth and absence of such a study resource anywhere out there online. Notably, many of the unique images here are being displayed online for the first and likely only times. (*These images are, incidentally, my personal photographs or scans of items in my own CanLit collection.) Along the way, too, I will try to provide some basic, core, and interesting details about the writers and the works referenced here so that readers can make their own judgements about who or what interests them. Chiefly, then, it is my intention to create more public awareness about our country’s earlier literature, and to create more understanding and appreciation of the same. Most Canadians today are simply unfamiliar with Canadian writers and books, especially the older and classic ones. This chronological blog is an online resource to turn to for a handy visual context and overview of our country’s literature, its developments, and important books, writers, and artists. Most of the authors and books mentioned here have disappeared from memory, and will continue to disappear from memory as will those fewer Canadians still familiar with or interested in them disappear themselves. 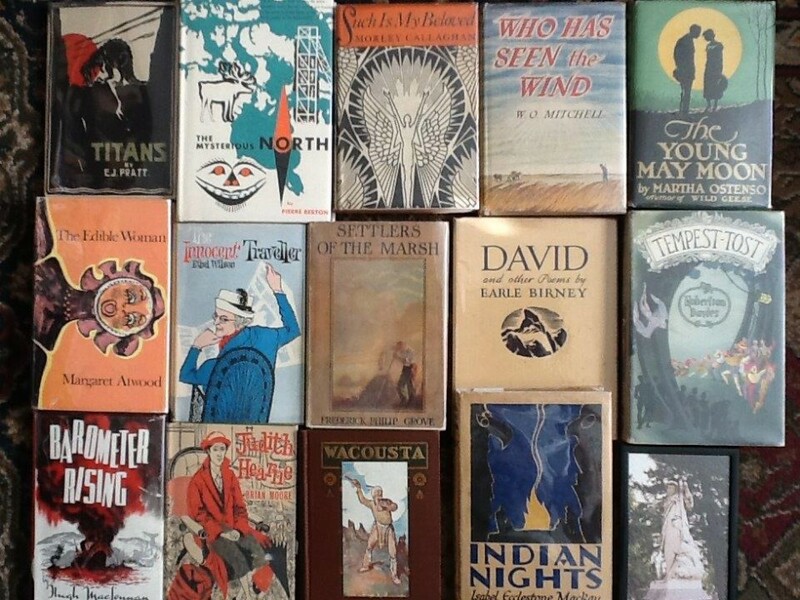 This blog is mainly a visual literary history and an online way of preserving the memory of these many Canadian books, writers, and artists. It is also hoped, incidentally, that readers of this blog will become more interested in CanLit, pursuing and purchasing titles and works by Canadian authors and artists, old and new, on their own. Please note: None of the material here is for sale; it is offered for non-commercial use–for educational information, illustration, and study purposes only. The blog is also Read-Only. *NB The long main original lineup is also arranged in chronological order, so if you want to read it from start to finish, you need to go back to Oct. 27, 2014. N.B. Clicking on any unopened picture opens all the pictures of blog. Return and refresh to read all including pictures.